Submission of an abstract is required for paper and poster presentations. Use the format given below. All abstracts must be written in English or Filipino and submitted electronically to artscongress@dlsu.edu.ph, bearing the subject: “Paper/Poster presentation, 6th DAC”. Files must bear the sender’s Surname in uppercase letters, followed by his or her given names in lower case letters, and a shortened form of the paper/poster’s title, eg., SANTIAGOjoseArtasEduc. Faxed submissions will not be accepted. Prepare your abstract as an MS Word document (.doc file format) consisting of 300-500 words using Arial 11-point font typed in letter-sized page, with one-inch margins on all sides. The abstract MUST BE in TEXT ONLY without graphs, pictures or tables, and should contain a title, name/s of author/s (underline the name of the presenting author), department/s and address/es. Abstracts for paper and poster presentations must contain a brief introductory statement of the research and continue with the summary of the results obtained, followed by a conclusion(s). It is not acceptable to say “the results will be discussed.” The abstract must also include a list of key bibliographic sources. Standard abbreviations should be used throughout the text. Any special or unusual abbreviation should be spelled out in full at first mention, followed by the abbreviation in parentheses. Please use a minimal number of abbreviations. Symbols (i.e. Greek) can be used as well as boldfaced, underlined and italicized characters. Include acknowledgements of the source(s) of research support (if any) on the bottom line of the abstract. Check the abstract carefully for grammatical or typographical errors. Upon submission, you will receive an email confirmation with an abstract reference number. Please use this number in all future correspondence with respect to your abstract. If the abstract of the paper is accepted, the author has until October 19, 2012 to submit the final manuscript, which will be published in the conference proceedings. If the paper is not submitted by the said date, only the accepted abstract will be included in the proceedings. Presentations on the days of the conference must not exceed 20 minutes each. The Sixth DLSU Arts Congress will include screenings of short films on subjects related to the theme during the last week of the Arts Month. There will be four (4) kinds of video categories to be accepted: Short Feature, Music Video, Documentary, or Experimental. A person can submit a maximum of 2 films. A submission of a 30-second trailer in mp4 format video excerpt is required. Films should not be longer than 15 minutes each. Music videos must have the original song from the artist or must have the consent of the artist for making the music video. All film proposals together with their respective youtube links, must be submitted electronically to artscongress@dlsu.edu.ph, bearing the subject “Film proposal, 6th DAC”. Files must bear the sender’s Surname in uppercase letters, followed by his or her given names in lower case letters, and a shortened form of the work’s title, eg., SANTIAGOjosefilmSorrow. The Film Proposal Submission Form may be accessed at the DLSU Arts Congress facebook page. The video clips of the 30-second trailer and the main film should be uploaded at Youtube. Faxed submissions of application forms will not be accepted. Upon submission, an email confirmation with a film proposal reference number will be sent. This number will be used in all future correspondence with respect to the film proposal. If the film proposal is accepted, the proponent is required to submit to DLSU a copy of the film in both DVD form and NTSC AVI formats on or before December 7, 2012. Other formats like Mini DVs and V8 will not be accepted. If the proponent fails to submit the film on time, he/she forfeits his/her chance of joining the Congress’ Film Screening. 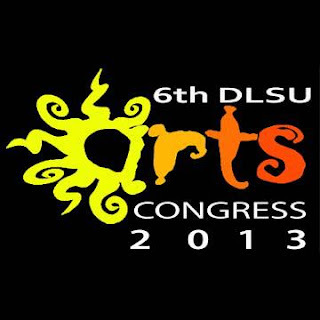 The Sixth DLSU Arts Congress will include workshops and demos on LEAP day, February 5, 2012. Workshops/Demos have to be on skills/competencies related to one of the colleges in the University (Liberal Arts, Education, Engineering, Science, Computer Science, Economics and Business). For workshop/demo proposals, submission of a description and outline of the workshop or a description of the art demonstration is required. All equipment required must be listed for entrance permission. The secretariat, however, discourages the use of open flame in any of the demos/workshops, and other things that the University may deem unsafe. Workshop facilitators must bring necessary materials for participants. The number of participants allowed for workshops must be identified. Workshops and demos must not exceed 1.5 hours each. All workshop/demo proposals must be submitted electronically to artscongress@dlsu.edu.ph, bearing the subject “Workshop/Demo proposal, 6th DAC”. Files must bear the sender’s Surname in uppercase letters, followed by his or her given names in lower case letters, and a shortened form of the workshop’s title, eg., SANTIAGOjosedemoOrigami or GOMEZkarenworkshopballet. The Workshop/Demo Proposal Submission Form may be accessed at the DLSU Arts Congress facebook page. Faxed submissions will not be accepted. Upon submission, an email confirmation with a film proposal reference number will be sent. This number will be used in all future correspondence with respect to the workshop/demo proposal. If workshop/demo proposal is accepted, the proponent is required to submit the full workshop syllabus or demo procedure on October 31, 2012. If the proponent fails to submit this, he/she forfeits his/her chance of joining the Arts Congress. The Sixth DLSU Arts Congress will include a term-long exhibit of artworks in coordination with The Museum at De La Salle University. Original artworks in the genres of drawings, prints, paintings (acrylic and/or oil on canvas paper or board), printed digital art, and sculptures are accepted. Only artwork proposals containing a portfolio of a maximum of three artworks with a maximum size of 90cm x 90cm (including the frame) will be accepted. No installation art will be accepted. All artwork proposals, together with their respective high-resolution photographs (300 dpi, at least 8”x10”), must be submitted electronically to artscongress@dlsu.edu.ph, bearing the subject: “Artwork Proposal, 6th DAC”. Files must bear the sender’s surname in uppercase letters, followed by his or her given names in lower case letters, and a shortened form of the work’s genre and title (eg., SANTIAGOjosepaintOcean). The Artwork Proposal Submission Form may be accessed at the DLSU Arts Congress facebook page. Faxed submissions will not be accepted. Upon submission, the artist will receive an email confirmation with an artwork proposal reference number. The reference number will be used in all future correspondence in connection with the exhibit. If the artwork proposal is accepted, the artist will turn over the artworks to the DLSU College of Liberal Arts on or before November 30, 2012. He/She must fill up and sign the Loan Agreement. If the artworks are not turned over on the said date, or Loan Agreement is not accomplished, the artist forfeits his/her chance of participating in the exhibit. The artist must retrieve his/her artwork/s from the DLSU College of Liberal Arts at the end of the third term of the Academic Year 2012-2013. The Sixth DLSU Arts Congress will include performances in the genres of dance, music, poetry reading, theatrical clips, and mixed genres. This will be held on the afternoons of February 6, 2013 as part of the University Week celebration. For performance proposals, submission of a two to five-minute video clip is required. Performances must not exceed 10 minutes for dance, music and literary readings, and 15 minutes for theatrical clips and mixed genres. Group presentations must not have more than 10 performers each. For easier transmission of video clips, the secretariat of the Fourth DLSU Arts Congress requires them to be uploaded to the Youtube. All performance proposals together with their respective youtube links, must be electronically (artscongress@dlsu.edu.ph), bearing the subject “Performance proposal, 6th DAC”. Files must bear the sender’s Surname in uppercase letters, followed by his or her given names in lower case letters, and a shortened form of the work’s genre and title, eg., SANTIAGOjoseballetCarmen. The Performance Proposal Submission Form may be accessed at the DLSU Arts Congress facebook page. Faxed submissions will not be accepted. Upon submission, you will receive an email confirmation with a performance proposal reference number. Please use this number in all future correspondence with respect to performance proposal. If performance proposal is accepted, the proponent is required to signify his/her intention to join the said Congress on or before December 7, 2012. If the proponent fails to signify his/her intention, he/she forfeits his/her chance of joining the Congress’ Performances. For more information, you may call the College of Liberal Arts of De La Salle University at tel. #: (632) 5244611 loc. 326 or 328, or email at artscongress@dlsu.edu.ph.